I sat down today to work on a plan. I have 4 weeks left to work on a virtual world art project. I HAVE to start. I MEANT to start. The 16 tabs open on my Chrome and pile of 5 ridiculously thick and heavy art books on my floor all point to the fact that I was TRYING to make a start and somewhere along the line I got lost and distracted. I was writing notes, trying to wrap my head around the concept of realities and how I want to express how I feel about that and how I am going to portray that through virtual world art and my brain slowly melted into something resembling custard. Complete and total creative block. Staring at the blank page was getting distressing. I kept willing my pencil to draw on the page…something…ANYTHING. Nope. Oooookaaaaayyyyy then. Stupid brain. So what do I do when I usually get creative block? I look to other people for inspiration. I visit art galleries and look at artist techniques. 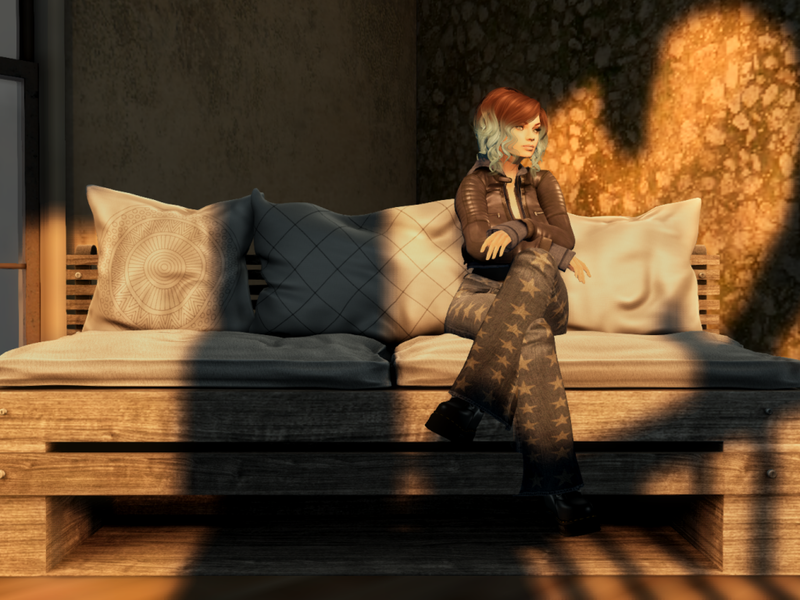 So if I am doing an art series in Second Life…who do I need to look to for inspiration in this moment? The artists of Second Life. I needed to get into the virtual world that I was trying so hard to explain to people and resolve my feelings for and understand. I needed to get there and see and experience and look for inspiration. Kultivate (2) is more than a gallery (they are actually FIVE galleries…but who is counting?) and a beautiful sim. They also contribute a substantial amount of support to the Second Life art community. They publish a magazine, “Kultivate”, they run regular art shows, events and in world tutorials and classes for a wide variety of art related topics. They support charities and they give opportunities to artists such as free gallery space and promotion. One day, maybe when I grow up and wrangle my brain into gear I think I would like to be there. It is something to aspire to. And that, I think, is also something that is important, JUST as important as gallery space…to have something to look up to and reach for. The next place I visited was the Empty Minds installation by Romy on the sim of MetaLES O (3.). I have been to MetaLES O before but I have not been to a Romy installation before so that was new to me. I pulled up my destination guide and saw it in the Editors picks. I try to make a point of trying out new places every week. Sometimes they are great and I am thrilled and delighted and connect with the place. Other times…not so much. This description was intriguing, “It is made known that if an idea is born into your empty mind, you must come to disregard it. Nobody knows why. The origin of that idea was lost. Maybe you’ll be the first to have the idea to not discard your ideas.” (Romy, 2017) The quote was so synchronous with my mood and mindset, I couldn’t help but visit. I loved that each individual grouping of statues is its own piece, but the whole of them make up something coherent and powerful. And OH DELIGHTFUL DAY!!! They were for sale at seriously decent prices. I bought two. I may have to go back to buy more…there was just something so compelling about them. They were so…melancholy in a way and so expressive in their simplicity. I looked and I wondered. I wondered at their thoughts and wished for just a moment, I could listen in on their minds. I marveled at the rich symbolic landscape and the dream like quality of the build. Empty Minds stopped the roaring chaos of my own mind. That blathering, chattering, screaming mess that occurs where I can’t pick out any one thing and focus long enough to get it down. I breathed quietly and observed this place that immerses you so completely in the idea of ideas. Upon leaving, I took that sliver of peace and ideas and tucked it away neatly in a pocket of my mind to take out and slip in to when the whirlwind of my own mind is all too much. And so from this place of quiet, I traveled to the delightful Moya Land (4.). This is one of my favourite places on the grid. It is utterly chaotic and assaults your mind with its visual noise from the moment you teleport in. But I LOVE it. There is just always so much to see and every time I go I see new things, I explore new parts of the sim and I stand and stare in amazement at the breadth and depth of the wonderful artist’s accomplishments. His work output is truly astounding. Moya land showcases the real life work of the artist (5. & 6.). There are pictures of his many exhibits and parades and accomplishments. But it is more than that. It is also his real life work, made real in a virtual form. The exhibits are remade and reborn and become MORE. They are there for everyone to see, regardless of WHERE you live and who you are. You can go in and see it and be bemused or be excited or just stand around and be confused. Moya has this subversive sense of humour that comes out in everything he does. It makes me smile and it makes me question everything from the idea of police brutality to the way art institutions and the canon of art choose and curate their exhibits. I still have not seen it all. I just know that when I go to Moya land, I come away feeling BETTER. So in some ways, I don’t really WANT to see it all at once. I just want to come when I am feeling a bit low or when I need inspiration, because I know in moments, I will regain my sense of playful curiosity and wonder for the world. There are other places I regularly visit. The Vordun (7. ), Immersiva (8. & 9) (oh SOOO many visits to Immersiva, but that is a WHOLE blog post in itself, which is coming up…no spoilers! )…but do you know what? The whole world is FILLED with artistic endeavours. The clothes you wear, the ways you move, the furniture you sit on, the trees, the road, the train, the water, the weather. All of it is from the creative minds of many. It is a world that encourages creativity from the moment you step in and become a part of it. Even when you are out of world, it never quite leaves you. You are encouraged to try your hand at 3D modelling, photo manipulation, making machinima or vlogging. In my case, it moves me along my personal journey of questioning and defining reality and everywhere I turn I find support from the community in sharing that inner dialogue with the world. I want to show the worlds that art is art, no matter where you create and it is ALL real.